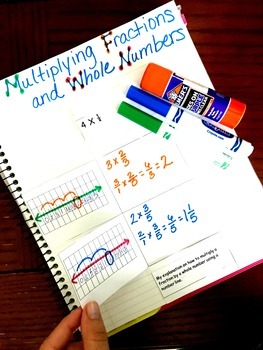 This product contains five activities to help you teach students how to model multiplying fractions by whole numbers. There are three activities in this download. The first activity uses fraction bars. The students work in groups of three to show that multiplication is also repeated addition and “add” up the fraction bars to solve a mixed number times a whole number. They will also use the fraction bars to change the mixed number into an improper fraction so they can practice the traditional algorithm. The second activity has the student draw arrays or visual fraction models to find the area of mixed numbers by fractions. The final activity has the students looking at arrays and determining the equation that the array represents. 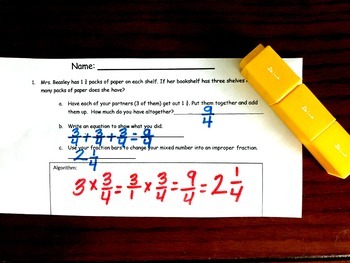 This one-page download is interactive notes that will walk your students through different steps they can use to model multiplication of a fraction by a whole number. The notes are designed to fit inside a composition notebook. 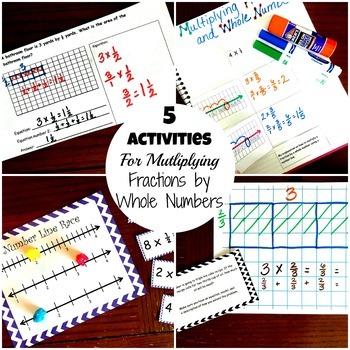 This activity focuses on students using number lines to multiply. The first page walks the students through three problems. The students will answer questions and follow directions to create their number lines. The second page gives the students three problems to try on their own. In this game, the children will solve multiplication problems involving fractions and whole numbers. They will solve the problem and move up the number lines to try to reach the whole number four first. The game is designed for a file folder. It includes the title page with directions and materials, a set of cards (you will need to cut out and paste onto index cards), and two game boards. This is an excel sheet. To get to the different pages look at the bottom left corner and click on the different sheets. 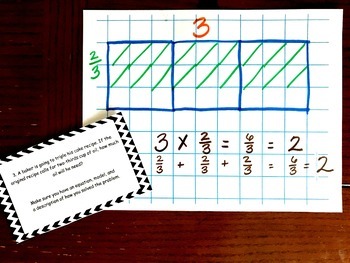 This printable consists of 20 task cards focused around multiplying fractions in word problems. A few of the problems are simple one-step problems, the majority though require numerous steps. A few problems have addition and subtraction of fractions so the students can not always assume they have to multiply.